Another week, another downpour, more squash bugs and spider mites! 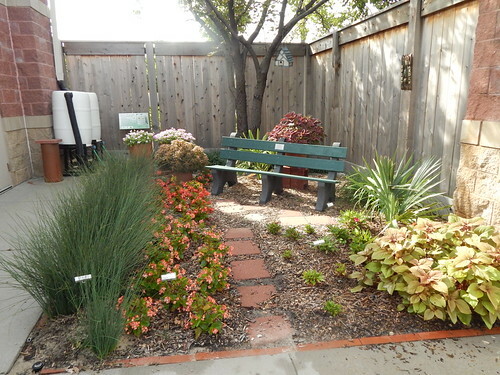 This gardening season has certainly come with its share of challenges in the Demo Garden, and I’m sure you are experiencing the same things at home. The general overview shows that things are still looking pretty green, although the tomatoes are looking a little sickly with all the spider mites. The squash are still looking pretty good, despite the onslaught of squash bugs. The ‘Tromboncino’ squash are still producing steadily. I prefer that over getting too many zucchini! I captured this image this morning while the squash blossoms were still open. 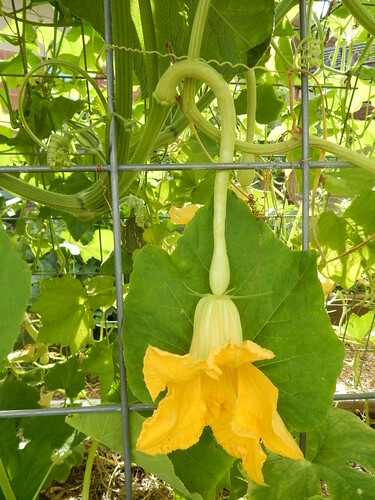 Female squash flowers have the immature fruit behind the flower and then the fruit continues to develop following pollination. I thought it was pretty neat to see how big the squash is already in this case, even before pollination! You could even harvest the squash at this point and stuff the flower with cheeses and herbs, then saute as is. 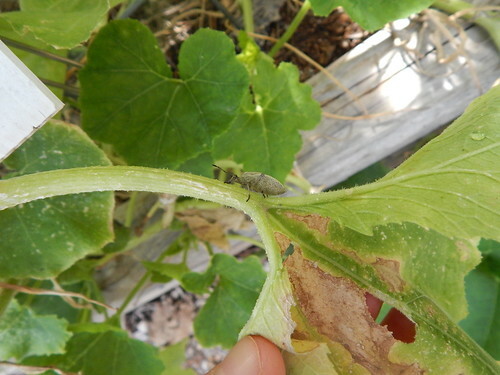 We are starting to see more squash bugs on the trellised squash. It isn’t unexpected, but nice that it held off until now. We are picking off eggs and nymphs as we see them as well as spraying once a week. We have also seen a couple of vine borers that our Master Gardeners caught early and tried the “surgery” method of cutting them out of the stems. So far we have no casualties of squash vine borers, which is a win in my book! Our Quiet Garden area is looking beautiful right now. There are several coleus, begonia, and impatiens varieties that are showing their colors in good form. These are all varieties that are either on our Prairie Star list of recommended annuals or they are in the trial right now to determine if they are worthy of being on the list. 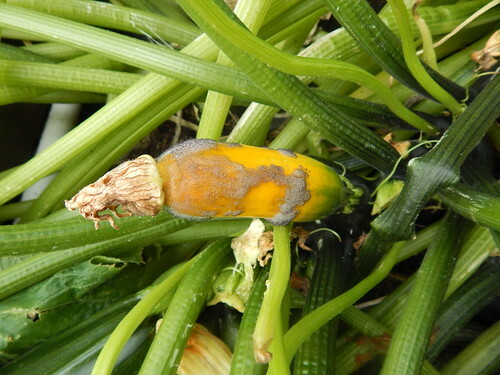 I noticed a few squash in the zucchini area that are showing this grey mold. It looks like it is primarily on squash that were not successfully pollinated, thus being more likely to rot. That predisposition to rot, combined with the rain this week and the density of the stems and leaves has probably resulted in the grey mold. The best thing to do is to just remove squash like this ASAP to prevent the mold spreading to other squash or the stems. 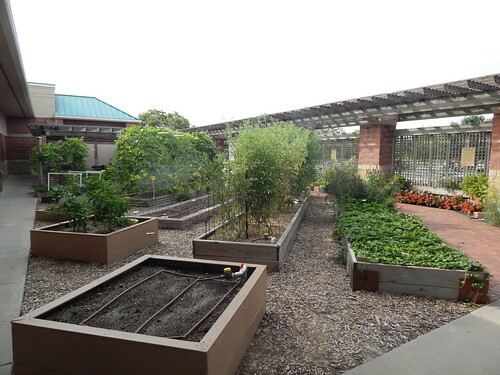 The Master Gardeners planted some lettuce seeds for transplanting outside later this month. 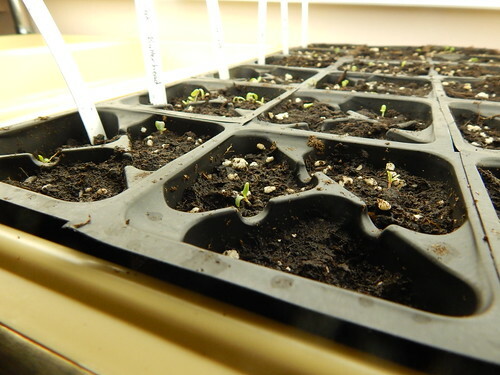 Starting the seeds indoors and transplanting is one way to make lettuce available to harvest earlier in the fall than if we were to wait until the weather is cool enough to plant seeds outdoors. I usually plan on about 4 weeks from when we plant seeds to when the plants are ready to go out in the garden. 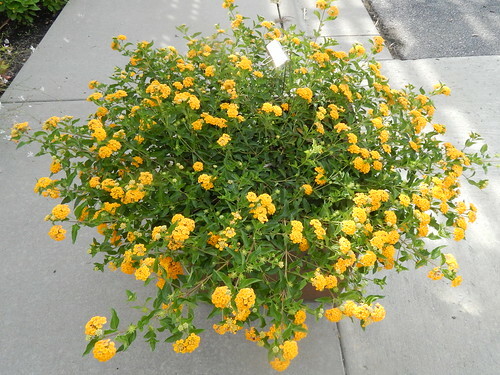 This is ‘New Gold’ Lantana that is planted in the containers near the garden entrance. It is looking spectacular right now! This variety is on our Prairie Star Annuals list as a variety that thrives in Kansas and blooms consistently all summer. It definitely looks like a winner this year. Posted on August 7, 2015, in PhotoEssays and tagged annuals, flowers, insects, lettuce, squash, squash bugs. Bookmark the permalink. Leave a comment.